If you're designing your living room, getting the right flooring is a must. But as one of your home’s hardest working floors, it has to be durable as well as good looking. As a space into which guests are welcomed, living rooms demand something smart underfoot, as well as striking the right note for relaxed everyday living. Then there’s a decision to make about whether it’s the fifth wall and creates a statement, or is a quiet backdrop to the room’s other decorative features. How to make the right selection, then? Easy! Get in the know with our guide. What choices are there for living room flooring? The options for living room floors are wide. UK homeowners continue their love affair with living room carpet but natural floor coverings made from plant fibres have become increasingly popular. Hard flooring – predominantly wood floors – can prove equally appealing, of course, especially if the living room is part of an open-plan kitchen diner design. How easy cleaning is and how often you’ll need to do it also needs to be factored in. If a surface that’s warm and soft underfoot is number one on your list of criteria, the merits of both carpet and plant-fibre natural flooring are worth considering. Carpet for a living room should be hard wearing. An 80 per cent wool, 20 per cent manmade fibre version will stand up to the everyday foot traffic and stay looking good. Household includes small children? You could go for polypropylene to maximise stain resistance. Pattern can add glamour: small versions look more traditional while large-scale motifs have a contemporary aesthetic. Thinks stripes, geometrics and even florals – now available with 21st century style. Natural flooring is also an option for the living room floor. Natural flooring suitable for a living room includes hard-wearing sisal, which can add subtle detail through interesting weaves such as bouclé and herringbone; rustic seagrass (which may need protection for a heavy traffic area: check with your supplier); and robust coir. The latter isn’t kind on bare feet, though, so won’t suit all households. Flooring classified as hard could work a treat in a living area, and can be softened by a rug at the heart of a seating area. Choices such as vinyl flooring or laminate flooring can pull off the look of natural materials without the same cost, while solid and engineered wood, and natural stone are enduringly beautiful. Alternatively, contemporary options like concrete and resin might be up your street instead. Wood introduces an organic element to a living room scheme, and the variety of species, tones, and board lengths and widths, plus the option of geometric parquet patterns mean it can be as subtle or statement as you like. Wood flooring can last for many, many years, and if it is damaged can be sanded and refinished. Engineered wood has equal natural beauty and the benefit of a structure that makes it resistant to changes in humidity. Look for engineered wood with a top layer that allows it to be refinished should dents occur – lower quality versions won’t offer this. As with solid wood, there are plenty of options when it comes to tone and look. Laminate is a great alternative to solid or engineered wood, especially if you are doing up a living room on an budget. It’s worth going for the best quality laminate so it’ll last. Make sure, too, that the version you opt for is suitable for a heavy traffic area. 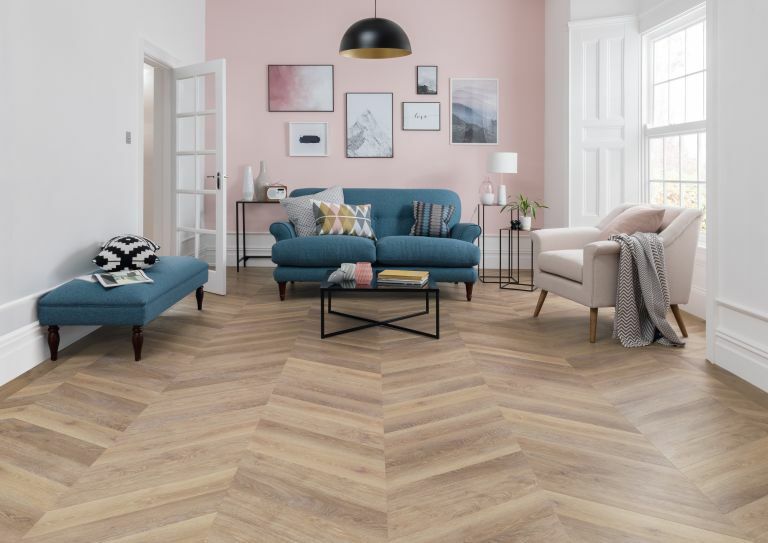 Vinyl might not be a flooring you’ve considered for the living room, but it’s a money-saving way to get the look of a more expensive wood, parquet or stone. Vinyl flooring also has the advantage of being more yielding and warm underfoot than other materials. Tiles may be a flooring you’ve considered for areas like the kitchen, bathroom and hallway, but not for the living room. However, both natural stone or manmade floor tiles can be appealing choices. They’re eminently suitable for this high traffic space, and easy to look after. Natural stone can be used in a living room, as well as throughout an open-plan space to create a consistent look and avoid breaking up the area with thresholds. For living spaces, extremely hard-wearing granite, limestone, filled travertine, slate, or even the opulence of marble are possibilities. Correct sealing is vital, as is checking a particular tile’s suitability with the supplier. Bear in mind, too, that some stones are more slip resistant than others, so tiles need to be chosen with the home’s occupants in mind. Manmade tiles include affordable ceramic versions which can create a neutral floor finish, or liven up the room with pattern. More durable – and generally more costly – is porcelain, which can emulate wood or stone effectively, or introduce pattern. If your prefer a modern style in a living room, check out these alternatives to more traditional floor coverings. Resin or concrete flooring is increasingly popular for contemporary homes, and ideal for emphasising the dimensions of an open-plan layout. Neither are cheap options, although concrete tiles are a budget alternative to a poured concrete floor. Different finishes and colours can be achieved with resin or concrete flooring, and they’re both easy to clean and care for. Rubber flooring is more reasonably priced alternative, can be laid as tiles, and its longevity makes it an attractive option. Floor coverings such as stone, porcelain and ceramic tiles work well with underfloor heating. Check with your supplier if you want to combine solid wood flooring with underfloor heating. Engineered wood should be fine, but do ask the question. Good-quality laminates and vinyls can be used with underfloor heating. Carpet can be teamed with underfloor heating. Check that the carpet and underlay conform to the maximum TOG (thermal resistance) rating specified by the heating manufacturer, though. Contemporary concrete and resin both work with underfloor heating, as can rubber flooring.